Who would’ve thought that this Japanese band who first came to Singapore playing at +SCAPE in 2012 with “Start Walking the World Tour” is now setting foot again on the sunny island and performing at the Singapore Indoor Stadium?! This is marked as their biggest show so far after the 2013’s show with “Who are you?? Who are we?? Tour” at the Hard Rock Coliseum and the 2016’s “35XXXV” ASIA TOUR at the Fort Canning Park. This is my third time coming to their concert and they have proven that they really polished their diamonds well. 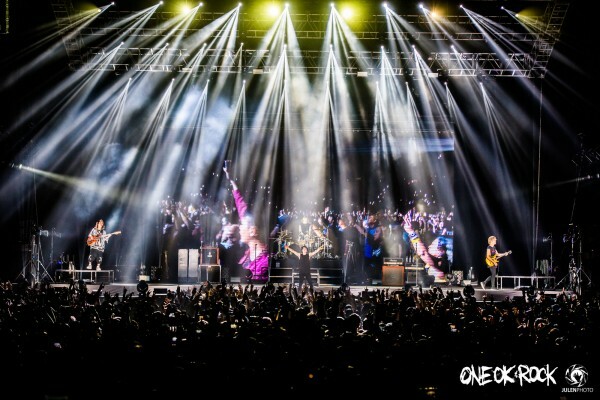 The band’s smashing performance is getting better and better every time they show up for their Asia Tour. On Saturday night at the Singapore Indoor Stadium, the second leg of AMBITIONS ASIA TOUR had a triumphal air. 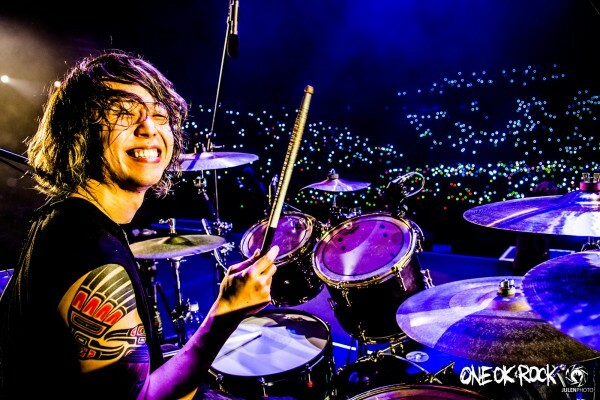 “We are so glad to be back here!” , vocalist TAKA, yelled to the 6500 adoring crowds, many of whom had worn the ONE OK ROCK’s outfit and official merchandise that were sold outside the venue. 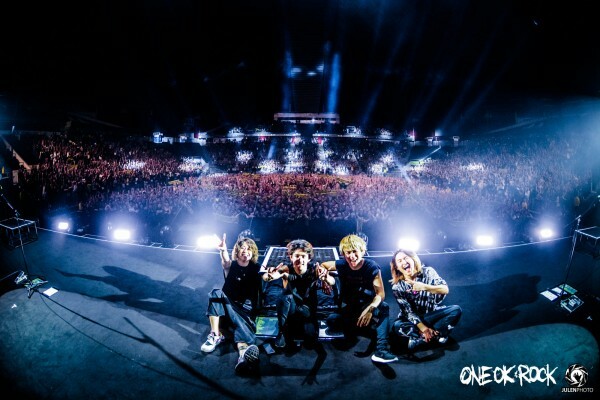 For ONE OK ROCK and their fans, the journey to the tour had been long awaited because for several years, One OK Rock had been concentrating their music promotion in US. Although there were some critics to their two latest albums which were said that the music is too Americanized and it tunes out their music individuality, they fine-tuned their musical range and skill spectacularly. They proved that they can gain more teenage followers all across the globe with their new music and we could clearly feel that vibe during the show which contained a wide range of emotion; the show was never not fun. What was missing maybe the interaction with the audience. Compared to their past concerts, they ran through the setlist with minimum talk and greeting. Well, the audience did not seem to be upset about it anyway since most of their fists pumped in the air all the time, added with the head bangs in several numbers, for two hours long. Moreover, in both standing sections, many whirls of mosh pits were spotted in some songs, especially when it was more rowdy during the final song, “Kanzen Kankaku Dreamer”. 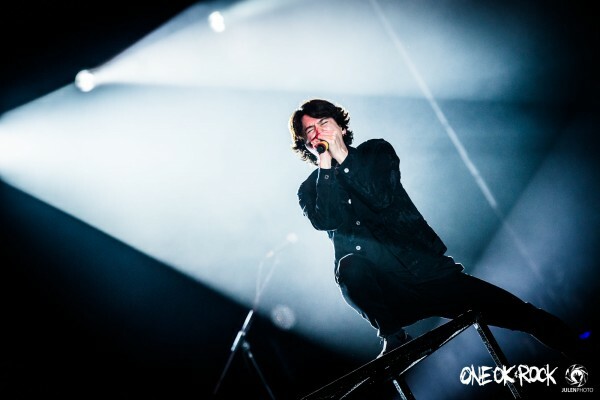 It climaxed with TAKA’s long range shouts wholeheartedly into the crowd in a way that was so triumphant. Impressively, despite being released almost a decade ago, everyone is still pumped out with this number. Some of the highlights of the night were “The Beginning” and “Mighty Long Fall”. Maybe most fans knew ONE OK ROCK from these two numbers because they used these songs for the soundtrack of live action movie “Rurouni Kenshin”. Also when “We Are” was being performed, I thought listening to it live gives more impact than the CD version, as fans made a series of hand wave in the air and sang the song together with all their hearts united. 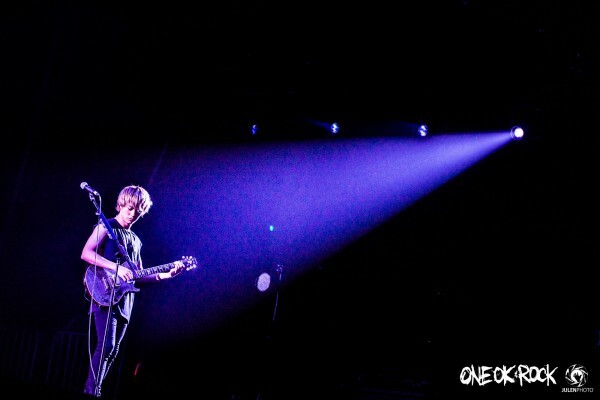 Another surprising moment was of course the members’ instrumental solo. 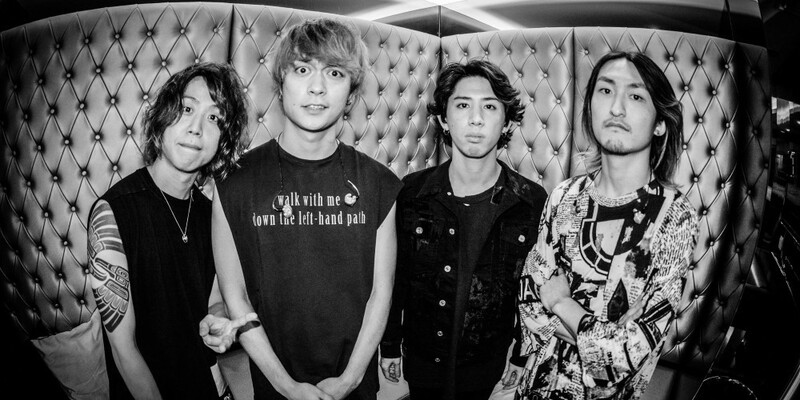 TOMOYA, RYOTA, and TORU gave TAKA resting times for several times while they showed off their musical ability and kept the audience dancing throughout the night. With “American Girl” and “One Way Ticket” though, ONE OK ROCK also prove that they can also play poppish songs and not only rock numbers. There were a lot of variety in terms of the tonalities, emotion and themes –both musically and lyrically. This performance demonstrated roller coaster of sounds. From grooviness and concluded with full-on rock anthems. The show started at 8.20 and finished at 10.15 with 17 songs including two encores. Thanks to AMUSE ASIA Inc.